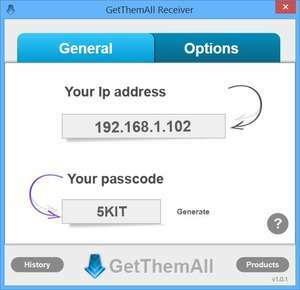 GetThemAll Receiver is the Windows counterpart to the mobile applications available for Windows Mobile and Android. The application is essentially a tool which allows you to copy files between a PC and mobile phone. The interface of GetThemAll Receiver is very basic and offers little in the way of customization. Once up and running, it will display your IP address and a passcode which can be entered on your cell phone. For security reasons, you should also check out the GetThemAll Receiver download at LO4D.com which includes virus and malware tests. Additional screenshots of this application download may be available, too.